SANFORD - Central Carolina Community College and The University of North Carolina at Greensboro have agreed to a new co-admission program called CCCC Spartan Passage. The agreement is intended to improve student access to undergraduate education, increase the efficiency of joint efforts in support of shared students, and improve the success of student transfer rates through associate degree and baccalaureate degree completion. "We are delighted with this agreement, which gives our CCCC students an opportunity to move forward with their educational experience at The University of North Carolina at Greensboro," said CCCC President Dr. T. Eston Marchant. "We are appreciative to Chancellor Gilliam and UNCG and look forward to working together in this partnership." 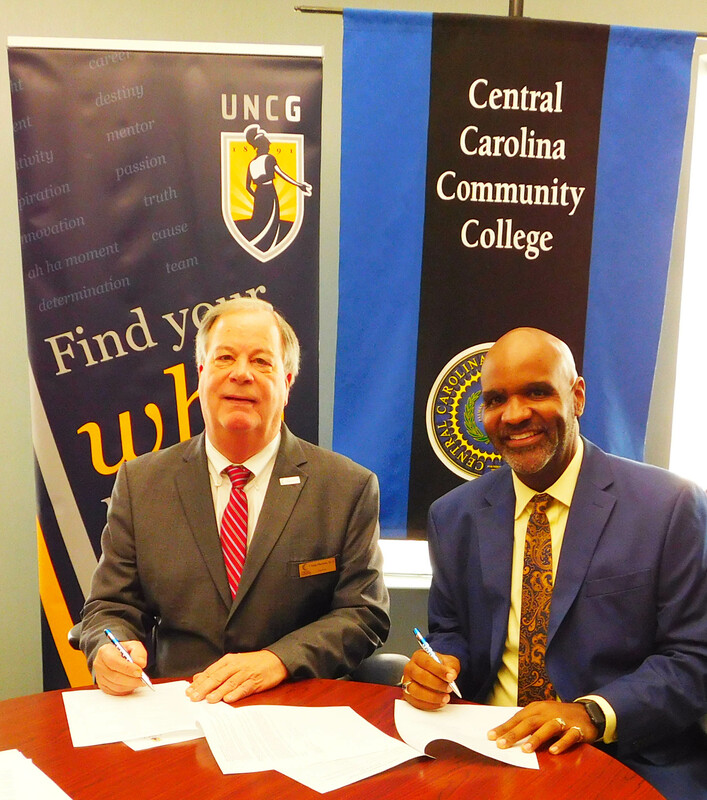 UNCG Chancellor Dr. Franklin D. Gilliam Jr. said of the agreement, "Our new partnership is designed to create access and expand educational choices for the more than 5,000 students at CCCC. Spartan Passage makes the transition to UNCG easy; we have on-site admissions counselors to guide students from all three campuses through the transfer process. The net result is a greater number of qualified graduates in a shorter timeframe at a significant cost-savings." Improve student access to undergraduate education. Expand educational choices that best meet each student's academic, social, career, and financial needs. Improve associate and baccalaureate degree graduation rates. Ease student transition between both institutions. Provide ready access to support services for student success, regardless of student location. Increase individualized assistance for students in evaluating career options and designing educational programs. Coordinate seamless administration of admission, financial aid and other student support services. Improve accessibility of information for student success. Share faculty expertise and create joint faculty development opportunities. Promote student learning through sound educational practices and expanded educational opportunities. "Students can meet their goals if we provide a clear road map toward completion," said Brian S. Merritt, Ph.D., CCCC Vice President, Learning & Workforce Development. "We appreciate this partnership with UNC Greensboro that will help us support our students and empower them to plan effectively for transfer opportunities." Scott Byington, CCCC Dean of Arts, Sciences and Advising, added: ""UNCG and CCCC have worked together for some time and we appreciate the opportunity to develop this agreement which enhances transfer for our students. We invest a lot of time advising our students for their transfer goals and thus it is great that we can now include the extra assistance from UNCG to maximize opportunities for our students transferring there." To learn more about The University of North Carolina at Greensboro, visit www.uncg.edu. To learn more about Central Carolina Community College, visit www.cccc.edu.